One Hand Clapping is the story of Janet and Howard Shirley, living a dreary life in the dreary fictional northern city of Bradcaster. Howard works at the local garage and Janet works in the local supermarket, and they spend their evenings having dinner in front of the television. Their lives begin to change when Howard’s photographic memory wins them a gameshow fortune. Janet doesn’t want their lives to change that much. She is quite happy with the routine of their ordinary life, improved as it is by consumer goods and modern household conveniences. But once Howard unleashes his unusual brain on the world, the used-car salesman can’t seem to stop; and what he sees as the logical conclusion to their success isn’t something Janet can agree to. 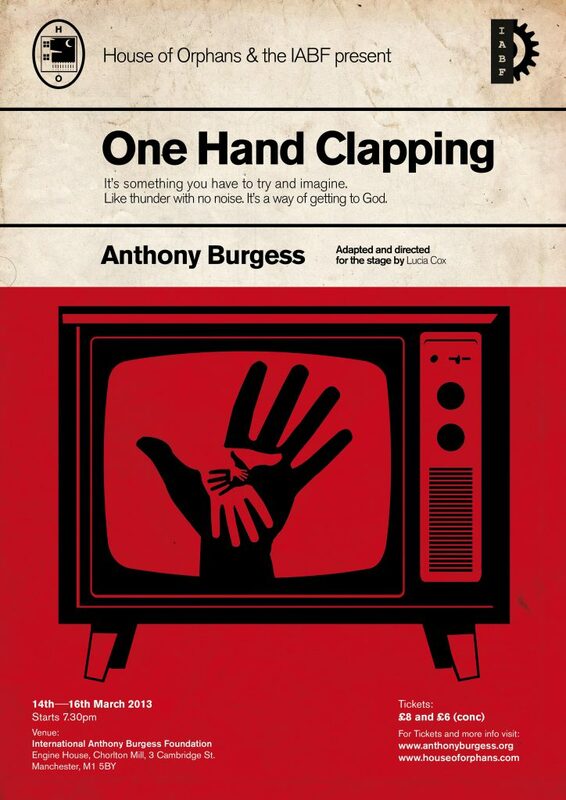 Anthony Burgess’s darkly comic satire of 1960s consumerism explores themes of the importance or otherwise of culture and education and the growing influence of America, and taps into contemporary anxieties about the future. ‘How far did I understand women? I would find out by turning myself into a woman […] I would write a first-person narrative about a girl working in a supermarket, pretty, cheerful, optimistic, married to a rather gloomy young man who suspects that the world is going to pot but is too uneducated to know why. The ambience of these two young people was presented very adequately in the Daily Mirror […] There was a weekly quiz programme with accumulative money prizes whose master was a Canadian named Hughie Green. In the 1930s the young Hughie Green was often on the front cover [of the Radio Times], a youth of our own age in tails and with wide happy mouth, a precocious singing and dancing star, brash and outgoing. We hated him. Now he was sober and greying and had difficulty with some of the harder words in the quiz questions. Him I would put into my book. The book was a rapid joy to write, a month’s worth of bricolage, for which commercial television and the Daily Mirror gave me most of what I needed. As the husband of my heroine works in a used car business, I had to study used car advertisements and drink with a man in a St. Leonards pub who knew all the tricks of shady manipulation which make used cars seem less used. There was no difficulty with my shopgirl’s idiolect. We heard it all evening long on the television. Her husband watches a quiz programme in gloom but thinks highly of the money prizes. He will enter the contest and specialise in questions on English literature. He knows nothing of this, having been, like his wife, to a secondary modern school, but he is oppressed by an image of the past full of great bearded men who transmitted to the future books which warn of evil and coming breakdown, books which my young man knows he will never read. Anthony Burgess, You’ve Had Your Time (1990), pp. 28-29. The title ‘One Hand Clapping’ is from a traditional Zen ‘koan’, or unsolvable riddle: “Two hands clap and there is a sound; what is the sound of one hand?”. Why do you think the novel is called this? Can you think of a better title? There is a lot of anxiety about the negative influence of television throughout the novel. Do you think this is misplaced? How far are these concerns relevant to our own uses of technology fifty years later? Howard thinks that reducing great culture to general knowledge is reductive and almost criminal. How far do you think that Howard’s concerns about this are justified today? Janet is one of only two female first-person narrators in Burgess’s novels. How convincing is her voice? The poet Redvers Glass describes England as ‘a feeble-lighted Moon of America’. Is it? Would it matter if it was? One reviewer claims that only 800 different words are used in the entire book. What effect do you think this has? Burgess says that his novel was popular in ex-Soviet countries due to its critique of Western materialism and its decadent culture. How far do you think this novel is in fact critical of capitalism, or of popular culture? Is its critique convincing?